The keynote is at 7:30 pp.m. on March 28 in the Baker Ballroom. Panels on March 29 are in Nelson Commons. With this conference, we hope to revisit questions that exercised John Calhoun and Elizabeth Evans Baker when they helped start the Baker Peace Studies program and our annual conference in the 1980s. Why and in what ways did a “liberal order” built on the framework of the United Nations and held up by political, economic, and military alliances translate into peace for Europe and North America? Why did it not equally bring peace to much of the rest of the world? Where do we stand in the 21st century, amidst a seemingly never-ending War on Terror and with the postwar order fraying? Our keynote speaker, Adm. (ret.) 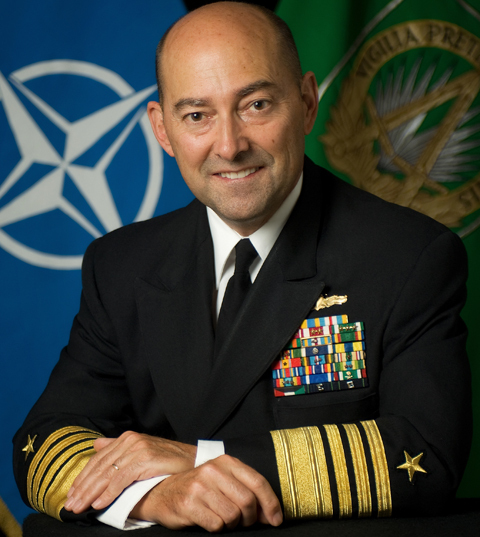 James Stavridis, served as Supreme Allied Commander, Europe, from 2009 to 2013. He recently retired as Dean of the Fletcher School of Law and Diplomacy and now serves as Operating Executive with the Carlyle Group. Some of his recent books include Sea Power: The History and Geopolitics of the World’s Oceans (2017), The Accidental Admiral: A Sailor Takes Command at NATO (2014), and Command at Sea (2010, sixth edition). Stavridis is a frequent contributor to news programs on television and radio and his commentary appears in Foreign Policy and major newspapers. He will present “21st Century: Challenges and Opportunities” in Baker Ballroom A at 7:30 pm on March 28 (Thursday). Other participants offer international perspectives and include leading scholars of the United Nations, transatlantic relations, the Cold War, and the changing nature of warfare, as well as students and practitioners of peace-building in our time. Cold War Frameworks 10 a.m. Global Challenges and New Wars 1 p.m. Erosion of the Liberal Order? 3 p.m.
We are delighted that three of our recent Ph.D.s will return to take part in the conference. Seth Givens (historian at the U.S. Marine Corps Histories Division) and Steven Wills will moderate two of the panels. Laura Seddelmeyer will present in the place of Mark Philip Bradley, who unfortunately cannot attend as scheduled. OU associate professor of history Dr. John Brobst will moderate that panel. The March 28-29 program opens with a Thursday evening keynote address in Baker Ballroom A at 7:30 pm followed by three discussion panels on Friday from 10 a.m. to 5 p.m in Nelson Commons. The entire program is free and open to the public.